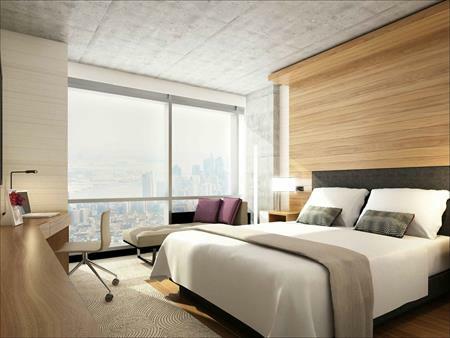 Renaissance Hotels has announced plans to open New York's first digitally enhanced hotel, in spring 2016. The 348-room Renaissance New York Midtown Hotel will be located in the heart of the Garment District at 35th Street between Seventh and Eighth Avenues. The hotel will use digital technology not seen in other new hotels. Guests entering the property will be able to interact with digital displays projected along the corridor, that respond to human motion through movements and graphic patterns. There will also be a virtual concierge and at the top of the hotel, four-storey LED screens will illuminate the skyline with a digital clock. The hotel will offer 1372sqm of meeting and event space that can accommodate up to 250 delegates and can be converted into multiple conference rooms with glass air walls. The events facilities are located on the seventh floor with floor-to-ceiling windows offering views of the city. Other facilities will include a club lounge, lobby bar, library bar and a 2439sqm fifth floor terrace with a retractable roof, private cabanas, comfortable seating and two fully-stocked bars.